After installing the files for Chinese support (including clicking the little "Use input method engines" checkbox I showed you there), you are ready to type some Chinese. Ubuntu 9.04 includes the SCIM (Standard Common Input Method) framework. This offers Smart Pinyin (智能拼音), Chewing (注音 / Zhuyin / Bopomofo and Pinyin), Wubi (五笔), Cangjie (倉頡) and several others. I will get you started and also compare the two most popular phonetic input methods. If you have Ubuntu 9.10, your default input methods are different! A basic suite of applications from OpenOffice.org, also known as "OOo", is included with Ubuntu. When we installed Chinese features for Ubuntu all files required for OpenOffice.org Chinese support were also installed. OOo Asian language features are usually enabled by default after the installation described on the previous page. In earlier versions this was not the case, and you had to go to Tools > Options > Language Settings > Languages then click the box next to "Enabled for Asian languages". There are more preferences we can set later, and if anything I describe below does not seem to be working correctly please go there and ensure at least that one box is checked. See the Ubuntu Chinese settings page for more info. or several others including Wubi, Cangjie and so on. A floating toolbar labeled "SCIM" (Smart Common Input Method) will appear at the lower right of the screen, and you're ready to input Chinese. <Ctrl-Spacebar> will switch you between English and the last SCIM chosen, or you can keep using the SCIM menu shown above. More on SCIM hotkeys and how to set their preferences later. When using Smart Pinyin, hanzi candidates will appear as you type. When character or phrase candidates appear, keep typing if they are OK (it guesses better as you complete cizu and phrases), then hit spacebar on your keyboard to confirm your selection. To choose different candidates, type the number of a character or phrase in the list, or click on it. Before you select candidates or hit the spacebar, you can move around within what you've typed with the left and right arrows on your keyboard, move around within the candidate window with the up and down arrow keys, or move between lines of candidates by pressing Page Up and Page Down keys. The Smart Pinyin SCIM supports both simplified and traditional characters, and of the two Pinyin input methods here I feel this one is the most sophisticated and easy to use. The simplified character candidate list is already sorted by common frequency of usage and will improve further as you use the system. The traditional character candidate list needs a lot of training but over time I think I'd prefer to use this IM for both character sets. The traditional list seems to start out in stroke order but will sort better as you use it. Although in simplified characters "hanyu" resulted in 汉语 on my very first try, in traditional characters I had to type and select the right "han" (漢) and "yu" (語) individually approximately five times before they advanced in the sort far enough that I could type "hanyu" and get 漢語 as #1. 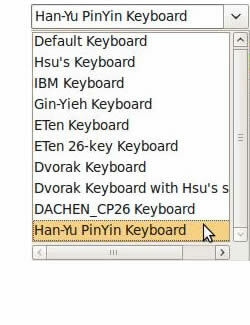 The Chewing SCIM, for traditional characters only, can be set to "Han-Yu PinYin" keyboard as the first "Default" keyboard, as well as Zhuyin, ETen, IBM and all the usual suspects. The Chewing keyboard preferences menu is shown here to the right. More on how to get to that menu is in setting SCIM preferences. To me Chewing does not seem as sophisticated as Smart Pinyin, and even requires you to type each Pinyin sound with a tone number. Of course, if you're a high-speed typist in Wubi or Cangjie you're just laughing at the rest of us now. And you have our respect, peifu peifu. :-) Those and several other SCIMs including Cantonese Pinyin are included with Ubuntu but I am unable to evaluate them myself.